One of the things that I love about New York City is that it attracts some of the funniest, most talented people in the world. It seems like on every corner, you can stumble into a bar and watch a performance that is funnier than anything you’d see on SNL. 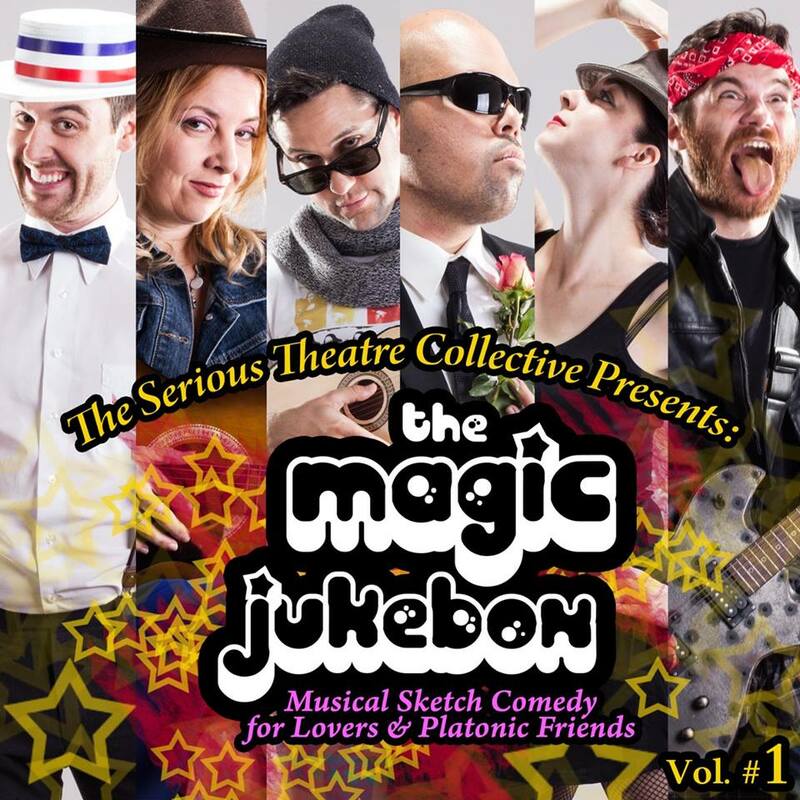 The Magic Jukebox, presented by The Serious Theatre Collective, is no exception. 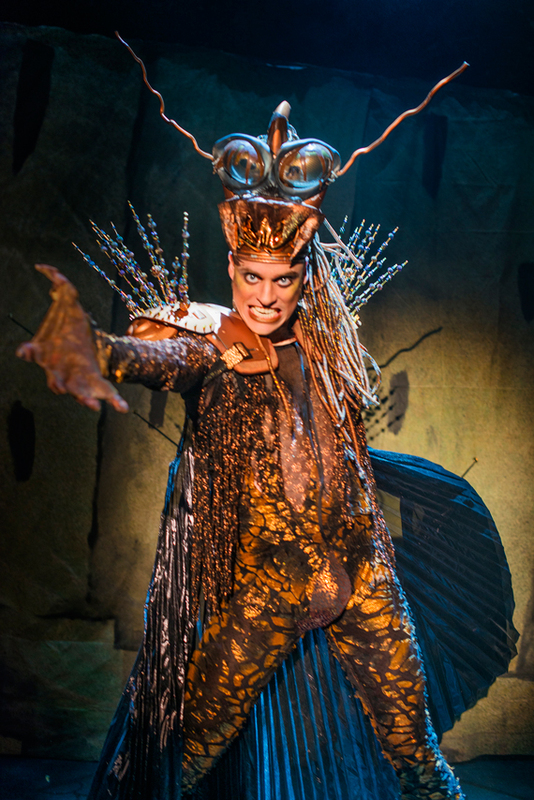 This is the third Serious Theatre production I’ve seen and I’m a big fan of their low-brow meets high-brow humor, and their efforts to make high-quality, original theater affordable. The Magic Jukebox is a zany combination of sketch comedy and musical theater. Make sure you go to the bathroom before the show starts because you’ll be peeing in your pants. 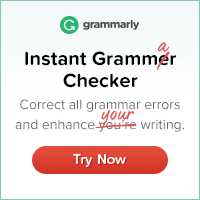 The collaborative writing style has led to some hilarious sketch ideas: a gospel choir that offers support during a first date, singing tele-spam, and homicidal dolphins just to name a few. Some of the performance highlights include Ricardo Delgado’s R. Kelly inspired cameo, any time Sam Durant Hunter’s on stage, and Abby Goldfarb’s comedic timing. It was especially fun to come early and sing along with the impromptu karaoke that sparked up from the house band’s catchy set. At $18 a ticket, you can’t afford to miss this show! Make sure to follow the collective on facebook to hear about future shows. Posted in art, creativity, music and tagged affordable shows in NYC, musical theater, sketch comedy, south street seaport, The magic jukebox, The secret theatre collective on November 4, 2014 by Tracy. Anyone who’s taken a music history class has probably heard of Brahms. He’s usually listed off with Beethoven, Mozart, Haydn and Bach as the greatest, most influential composers of all time. But like most great artists, he almost let his self-doubt keep him from sharing his work. 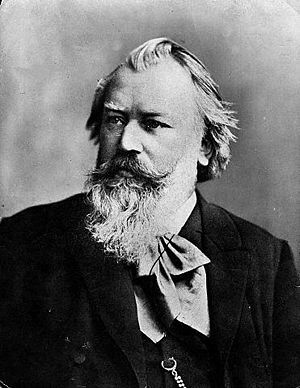 It took Brahms 20 years to write his first symphony. 20 years! Why did it take him so long? He was paralyzed by his adoration of Beethoven. He loved Beethoven’s music so much and thought there was nothing he could add to the canon. He even had a marble bust of Beethoven overlooking his work space. He destroyed much of his early work, thinking it wasn’t good enough to exist in the same world as Beethoven’s music. Beethoven’s influence is obvious in Brahms’ first symphony. 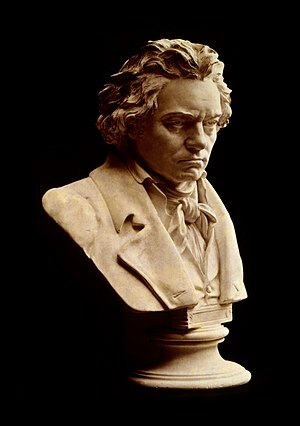 Some critics jokingly called it Beethoven’s 10th symphony. But that doesn’t mean that it’s not a great work of art. And he was able to continue making truly inspiring and unique music for years afterward. This is a problem a lot of artists run into; either we’re undermined for being too similar to our influences, or we are too intimidated by “the greats” to make anything original. At art school, before anyone would discuss your artwork they would ask your influences. Then when they’d look at the actual work they’d say, “This just looks like a bad Debuffet/ Klimpt/Monet.” And if you say you don’t have any influences, you’re considered naive or arrogant. Even an untrained artist is supposed to know that Grandma Moses influenced them…duh. In this case, I don’t think the artist needs to change, it’s the critics that need to get over themselves. Sometimes it seems like they’re just looking for an excuse to name drop. If you have a spark of talent you owe it to yourself to express it. Take your influences and put your own spin on them. As Newton said, “If I have seen further it is by standing on the shoulders of giants.” Imagine how boring life would be if everyone stopped trying to make art after great work already existed. The radio would only play Beethoven. The libraries would be filled with Shakespeare and the movie theaters would only be playing The Godfather. We need a little Brahms to spice things up. I came to Spain to learn Spanish, eat Paella, see some Gaudi, and drink Sangria. I did not plan to see Flamenco. I thought is would be really cheesy. Women in frilly, red dresses dancing around and snapping to over-enthusiastic guitar strumming. Count me out. But Mike kept saying he needed to see some authentic flamenco, so we asked around and heard about a great underground flamenco club. There were plenty of signs all around Madrid, Barcelona, and Granada for the “authentic” flamenco experience- 40 Euros for dinner and dancing. 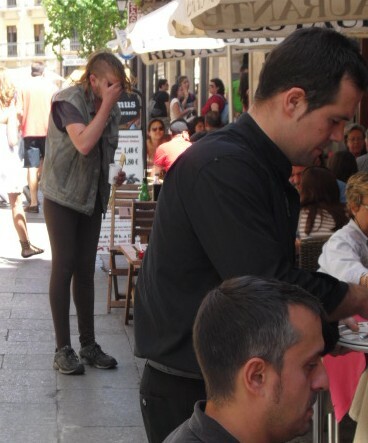 For some reason I couldn’t imagine the original flamenco dancers performing in front of dining tourists. 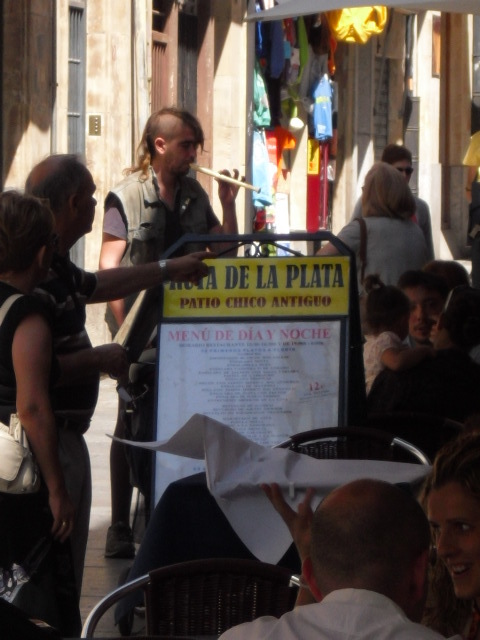 The place we found was in Granada, on Carrera del Darro called Le Chien Andalou. It was only 6 euros, and it blew me away. We walked in and it was a brightly lit, white-washed cave, about forty feet deep, ten feet wide. The stage was only about 8 by 10 feet. We were told to get there an hour early to get a seat. When I walked in, I was skeptical. It was almost empty. We sat next to a guy from Colorado, and I thought, oh great this is a tourist trap. By 10 o’clock the place was jam packed. All of a sudden the lights went down and a chubby, balding, blond haired guy walked on to the stage with his guitar. When he began strumming, the room fell silent. If you closed your eyes it sounded like two or three people were playing. When I opened my eyes I was captivated by the faces he made. He looked evil, almost possessed by his guitar. His name is Josele de la Rosa. Next the singer and dancer joined the stage. The singer was a young, pretty blond. 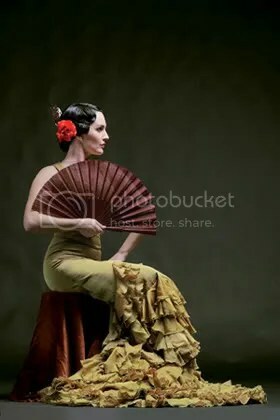 From what I read about Flamenco singing, the singer is supposed to be old, haggard, and lived through a lot. I didn’t think this young girl could cut it, but the second she opened her mouth I got goosebumps. Her voice was so rich, deep and raw. Most songs were just one line sang over and over again. It became hypnotic, but the subtle changes each time were heart-wrenching. After the second song I realized I was crying. I did not expect to be overwhelmed by singing in a dive bar. The singer’s name was Fita Heredia. I have never seen such raw emotion before in my life. With each movement of her pinky, with a flick of her hair, with a hip pop she was able to say a thousand words. At this point I was a mess. Not only was I crying but my nose was running uncontrollably. I wasn’t even sad, just so overcome with emotion. She was able to show such vulnerability in her face, yet her movements had the strength and bravado of a bullfighter. The dance got faster, and more erratic, and almost violent, until the stopped suddenly and the lights came on. I looked around and to my relief I wasn’t the only one reduced to tears. Nearly everyone was dabbing their eyes with napkins. Even the guy from Colorado. He said it was far better than Eric Clapton, a performer he’s followed his whole life. Mike was speechless. He’s a musician, and even he was blown away by the performance. It was something so pure, so vulnerable, and so beautiful. If I lived in Spain I would become their groupie. They made me want to take flamenco classes. A strange desire for someone who can’t clap in rhythm.